As a graduate of the School for Applied Sciences, Olushola Bukoye set up her Buks Bakes business in 2014 and was awarded a place on LSBU’s Graduate Entrepreneur Scheme for 2017/18. As a master baker, she participated in the BBC’s British Bake Off Extra Slice in 2016. Olushola says that she took part in the graduate enterprise scheme – three years into her own enterprising endeavours – because it “is a very good opportunity for me to improve my business. I saw it as a chance to evaluate my business, rebrand and scale up its operation, with the support of experts and mentors. 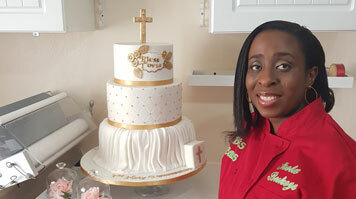 Setting up Buks Bakes in 2014 on a part-time basis, Olushola committed herself to it fully after completion of her MSc in Food Safety and Control. Now called Iconic Bakes, the business produces made-to-order personalised wedding cakes and celebration cakes, which are unique to every individual and celebration. “I’m really enjoying running my own business, and my goals are to keep delivering quality baked products in real time as well as teaching baking, food safety and control. Having recently concluded an MSc in Food Safety and Control course, I believe that the proposed training arm of my business will be a real asset, should help to enhance LSBU’s profile and the UK economy at large. My classes will be offered to enthusiastic youths, women who are both employed or need to return to work, and other interested Londoners. This will greatly improve social inequality by ensuring that more youths and women are able to gain valuable skills and an income,” she says.